Richard “Pete” Carver Porter, Sr., 85, of Currie passed peacefully from his earthly life on Saturday, May 19, 2012 at his home surrounded by his family. He was born December 21, 1926 in Pender County, the son of the late John Alexander and Alice Myrtle Carver Porter. Pete is preceded in death by sisters, Ruth Saint-Amand, Blanche Lindsley and Edith Williams and brothers, Robert “Corky”, Jay, Earl and George “Buddy” Porter. Pete is survived by his beloved wife of 61 years, Ann Register Porter; daughters, Alice Naumuk and Susan Porter both of Currie; son, Richard Porter, Jr. (Patti) of Wilmington; grandchildren, Paul Naumuk (Edelmira), David Naumuk (Lindsey), John Naumuk, Richard Porter III, Mason Porter and Jamie Porter; great granddaughters, Isabel and Estrella Naumuk; and many extended family and friends who loved Pete dearly. 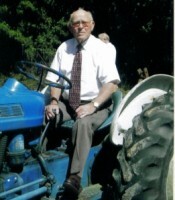 He was a lifelong, faithful member of Moores Creek Baptist Church where he served as church treasurer for many years. Serving his country honorably in the US Navy during WW II, he was in the naval convoy that witnessed the Japanese surrender which took place on the USS Missouri. He was called back to active naval duty and served during the Korean Conflict. He was retired from Federal Paper Company and was a Pender County Farmer. Pete was a devoted husband and loving daddy, granddaddy, brother and friend. Being outdoors in God’s beautiful world, Pete enjoyed nothing more than setting catfish hooks and catching catfish in the river. Many remember Pete’s catfish stew and the good times that were had at his and Ann’s fish fries. He will be remembered as a gentle and kind man who loved God and lived by a simple creed: Do justice, love your neighbor, and walk humbly with God. Amongst the legacies that Pete leaves behind are the importance of God, Family and Country. Funeral service will be at 3:00 p.m. on Tuesday, May 22, 2012 at Moores Creek Baptist Church with the Rev. Philip Eakins officiating. Burial will follow in the church cemetery. Casketbearers will be grandsons and nephew, Patrick Miller. Honorary bearers will be Bobby Barefoot, John J. Rowe, Ted Croom, Eddie McCormick, Jay Porter, David Porter and Alex Porter. The family will receive friends 6 to 7:30 p.m. Monday at Quinn McGowen Funeral Home in Burgaw. Memorial gifts may be given to Lower Cape Fear Hospice Foundation, 1414 Physicians Dr., Wilmington, NC 28401 or to Moores Creek Baptist Church, C/O Kay Nobles, 203 Bowers Lane, Currie, NC 28435.